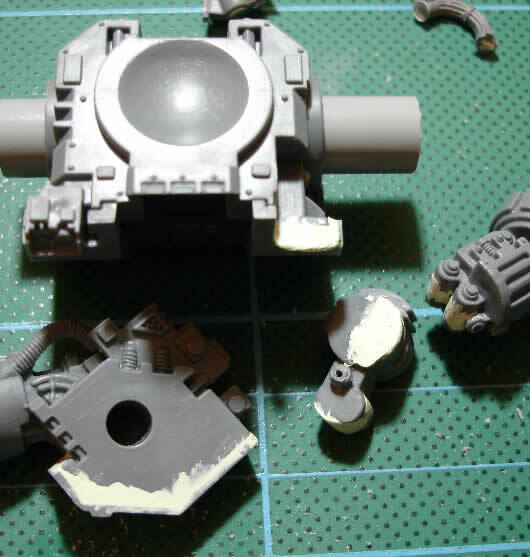 Just discovered a small dilema when starting to clad the various bits of the Dreadnought. Due to the angles on the shoulder on the arm, using the textured plasti-card isn’t going to work. Basically the front slope is a greater angle (thus longer) than around the side, resulting in the texture not wrapping correctly. Going to have to think about a solution as it would have been good to have clad the arms – bah! Pictures to follow, but I made some progress on cladding the torso with plasti-card last night. It could be a pain to fill the edges, but once done will make the Dreadnought look quite beefy. The initial fill went quite well and I filed down some of that, though ran out of time to do a second fill, which is a bit of a pain. I need to get the leg assembly finished by the end of the weekend to stand a chance of hitting my deadline. During my perusal of the good old internet, I chanced across an entry that won gold at the Chicago Golden Demon. The entry is fantastic – just the right balance of realism versus fantasy. Metallics are definatly worth inspecting closely as they’re spot on, looks like a fair number of black washes to remove the shineyness of metallics and highlighting as if they were a regular paint (as should be done). Edit: The penny just dropped – this is the chap who did the Dreadnought painting tutorial for miniature mentor – a vetran of many Golden Demon competitions. The first of a couple of pictures. 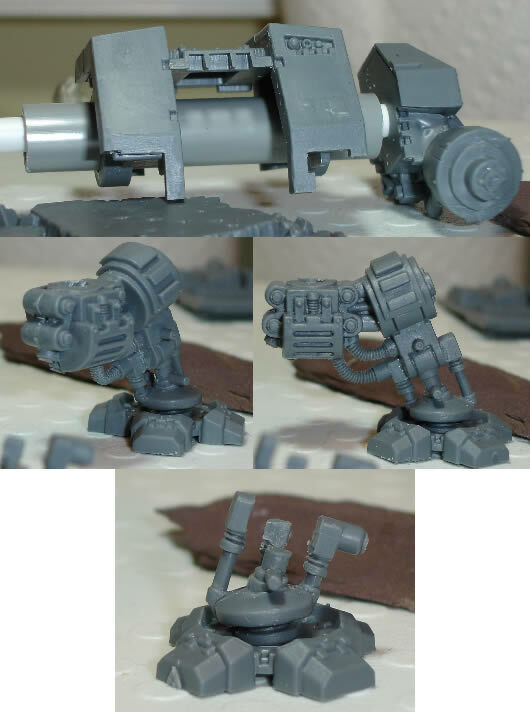 This one shows my progress on converting the lascanon arm of the plastic Dreadnought into a heavy bolter arm. My concept is to mimic the close combat arm with its flap pivot and elbow. It still needs a fair bit of work and significant filling. The elbow joint may also be fun and games as plastic disc’s aren’t a common thing to have lying around. Next up is a quick round up of my initial rough fill. The putty is a mix of green stuff and standard milliput, however in this case I didn’t quite have enough green sutff in the mix and it didn’t adhear quite as well as normal. The picture is deceptive, its not as smooth in some areas as it looks. The basic concept is that I make sure that all deep gaps and large areas are filled in. Tomorrow, once this is rock solid, I can trim the excess off and file areas flat. At least one more fill will be required as areas won’t be filled enough, or I’ll over file. Later on, some gaps will be filled with pure green stuff, but these large areas need to end up as if they were actually part of the model itself. So that I can keep up with what things need to be done, I’ve knocked up this hit list, which looking at it, is unbelievably long… The torso assembly is the bit that is worrying me the most as this is the bit I was hoping to have completed for the 9th. Very impressivly the bits that I ordered on Sunday arrived yesterday. That was a sheet of textured plasti-card and some plastic strips from Fred Aldous, and the pair of heavy bolters with drum magazines from Bits and Kits. The turn around for these was fantastic and I really wasn’t expecting them until today at the earliest. Ok, just to make it official – it’s highly unlikely that I’ll be doing any work on the Dreadnought tonight as I’m donating a pint of blood. That said, a miniature with a back banner can look bloody impressive in a cabinet. Those extra 3″ or so can look fantastic if painted well and make it stand out from the crowd, miniatures with some freehand on them also tend to get noticed more than those without. Thinking back, there was a thread on the CoolMiniOrNot forum a while back where somebody sculpted and cast up a banner for a large scale Forge World marine. Casting it up meant that it was wafer thin and could easily be cut and hacked around to make it battle worn. Plus the texturing meant it could be painted in the same way as a miniature. A few shots of the components that have been worked on so far. Top image is the torso. I’ve sliced out the sarcophagus and lopped off both spindles for the arm mounts. I have cut two pieces of tubing to allow the arms to be fitted and positioned as wanted. I’ve now cut off the pelvis joint struts, in preparation for the custom ones. I have a piece of plastic rod that is perfect for the larger ones and will likely use wire (for strength) for the central strut. I’ve just taken a high quality scan of the reference image I’ve got of the Aesir Dreadnought from the Horus Hersey CCG. This captures the whole essence of what I’m after. Of note is the Thousand Son with holes in him under the Dread’s foot and the ‘shark tooth’ grin on the face guard for want of a better description. I may or may not choose to have mine thumping another Traitor Marine. 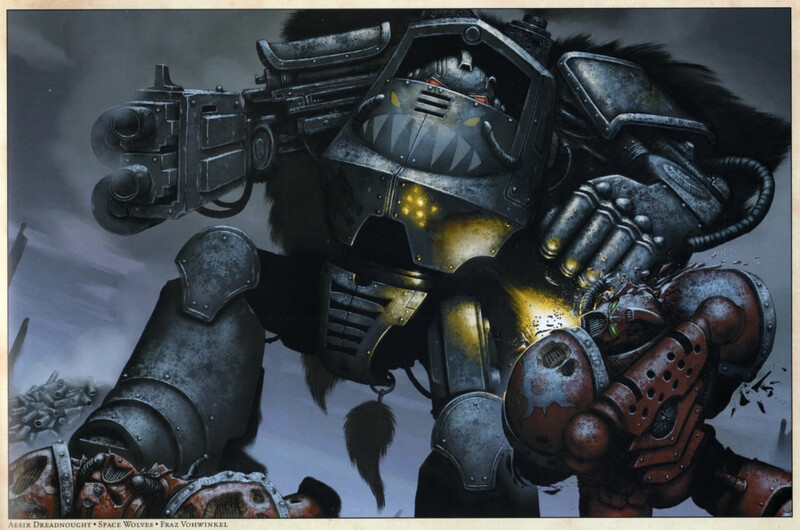 The basic concept is that the Space Marine chapters are still using a significant portion of the equipment that was created before the great betrayal. The capacity for manufacture is very low, so the chapters will treat every piece of equipment as slightly sacred/revered/etc. However in the ten thousand years of use equipment will have been repaired and replaced so many times that its original form will likely have been lost. Occasionally the tech adepts will discover the plans for a new piece of equipment, or a discovery will be made (put demolisher cannon onto rhino = vindicator) and slowly over a few centuries this will become more wide-spread. 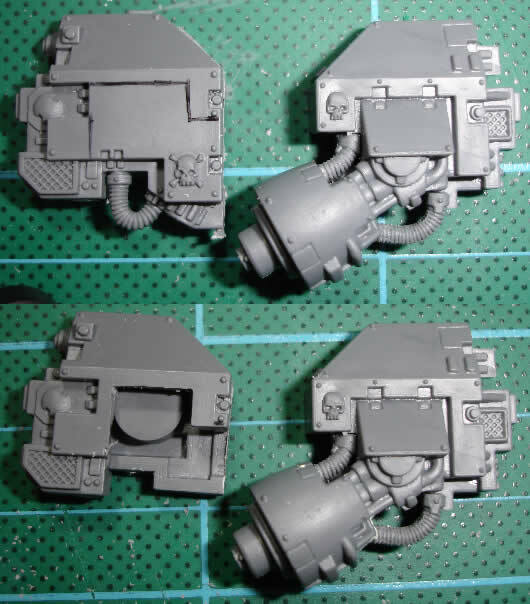 As such the Dreadnought I’m building will be an upgraded version of the Dreadnought used during the Horus Heresy – although with a different entombed Marine and all elements of the Dreadnought having been replaced.